my name is Steve and although I've never raced a real T/A Camaro or any other make race car for that matter due to not enough finances and only being 40 (25 at heart...lol), Trans Am racing is my passion and hobby and I'm trying to do my part in keeping it alive in the gaming community and younger generation as well by founding/co-creating two "as close to real as possible" T/A race series' (Midnight Club LosAngeles and Gran Turismo 5) and am in the process of planning probably what will be the best representation of T/A racing, Forzamotorsport 4 (upcoming XBox 360 title) in the club I am "a" leader of called the Camaro & Classic GM club. (aka...MCLA Camaro Club). I'm in no way here trying to advertise the club, I'm just explaining who I am and what I represent. I know, you may be thinking, forget this guy because he's just into games and not the real thing but I want to share with you my story and what I'm about before you discount my genuine passion for the "best" racing series in history in my opinion. I am a very good driver, and am pretty sure I'd be a good racer in real life but not only can I not afford to own or race these cars which would be my dream even if it was in the "more careful" more current "historic races" but I can't even afford to own a custom car anymore due to family issues I won't go into. Ever since I was a kid, I've been into muscle and pony cars and recently even owned a '71 Camaro 350 4 spd. which is pretty much my dream car and I had to sell it after owning it for 5 years to my Dad for financial reasons. In fact my 3 favorite pony or muscle for that matter are the '70-'73 Camaro, the '69 Mustang and the '70 - '72 'Cuda all original Trans Am race cars in their day. Anyway, I turned to games to satisfy my custom car/hot rod/race car/speed needs as that is my passion and I can't just live without it and I really have no other way. The difference between why I play racing games and why some others do is that I want "as close to real of an experience as possible" so I'll put approx. 20 hours into recreating T/A cars on MCLA (Midnight Club Los Angeles) or put weeks worth of work into creating realism in mine and my "Virtual Racing Association" friend & co-owner JadeCat95's multiple game Trans Am Racing series'. I know I'm kinda going on and on but its because I want to make sure I prove that I'm a genuine T/A racing and Pony car lover (especially the Camaro). I will provide links to our T/A race series web pages & videos and some of the T/A cars I have recreated or created to prove what I'm saying. My question is, and again its because we want to properly represent the original T/A series and keep it known and alive among the youger generation as well, are there many pictures of the original T/A pace cars back then and if so could someone post some or guide me the right direction to find them? I've searched the internet like crazy because I don't have the money to go buying all the books I need (although I haven't tried the library yet) and all I've seen is a Javelin (can't see it all), a Camaro I think I found in this forum and now the yellow Shelby Mustang in here as well. This latest Trans Am series in Forza 4 that we are planning allows very detailed paint jobs, engine sounds, handling and race modifications and includes the following accurate Pony Cars that if not the correct year/make are at least are close: '69 Camaro, '70 Javelin, '70 Mercury Cougar, '68 Barracuda, '71 'Cuda, '73 Trans Am, '70 Boss Mustang, '68 Shelby Fastback Mustang, '65 Notchback mustang as well as the possibility of the under 2.0/2.5 liter class of the Porsche 911, Alfa Romeo Giulia Sedan, Datsun 510, Datsun 240Z, Toyota 2000GT and possibly more so I'm hoping to make this series as real as possible and "seriously" represent the original "real" one that deserves all the recognition and respect it can possibly get. Welcome. I have not done a whole lot of collecting of pace car photos but here are a couple. The first is from the 1967 Mid-Ohio Trans-Am. It shows a pretty much unaltered Indy Pace Car Camaro. The second is not from a Trans-Am but from an SCCA National event at Marlboro Raceway in Maryland. If I run across any more, I will post them here for you. I'm fairly certain I remember a 69 Camaro with an endura bumper leading the pack towards turn 2 at Laguna Seca in 1969. The picture must of come from Jon at some point. I'll see if I can find it. Thanks so much guys... any pics are greatly appreciated. That's very interesting that they used other pace cars such as indys at times. How often did SCCA use their own pace cars? I've seen one Javelin pace car but not well in some original '69 T/A footage, a Camaro in an original photo and can't remember where. (probably here.. lol) and finally the Shelby convertible in the picture set that was posted here in the forum recently recently but that's it other than the two new ones in this thread. ...I've seen one Javelin pace car but not well in some original '69 T/A footage, a Camaro in an original photo and can't remember where. (probably here.. lol) and finally the Shelby convertible in the picture set that was posted here in the forum recently recently but that's it other than the two new ones in this thread. Oops, said the same thing twice...lol! Sorry about that. Is there any other good sites to find original Trans Am pics other than www.trans-amseries.com ? I've been to many sites but they weren't very memorable or I would remember the names. So far this site and the one I just mentioned are my main sources for everything Trans Am and would love more. Hopefully this isn't too off topic because I still really badly want to find more T/A pace cars but any Trans Am pics are exciting to see and I've enjoyed every one that I could find on this forum..thanks! In 1967 Chevy used their 396 Camaro show car to pace the Can Am race at Road America. It is called the Cherokee and is still around today. 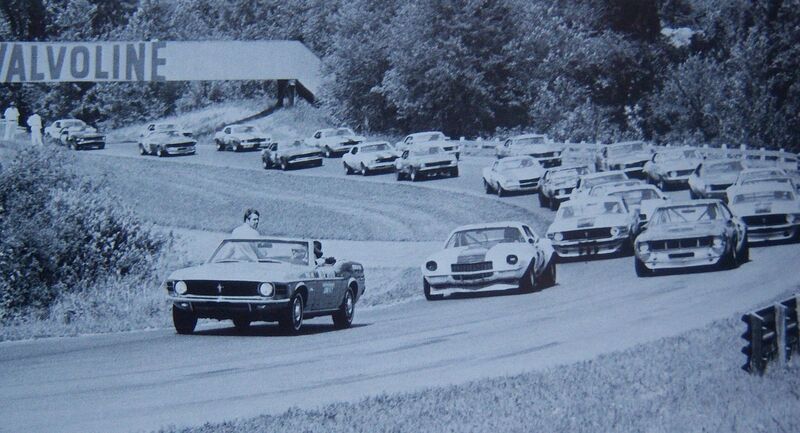 Chevy liked to bring special cars to Road America in the 60s. I have read that they used the 1968 Z/28 convert built for Pete Estes to pace the Can Am race in 1968 but have not been able to find a pic of it. 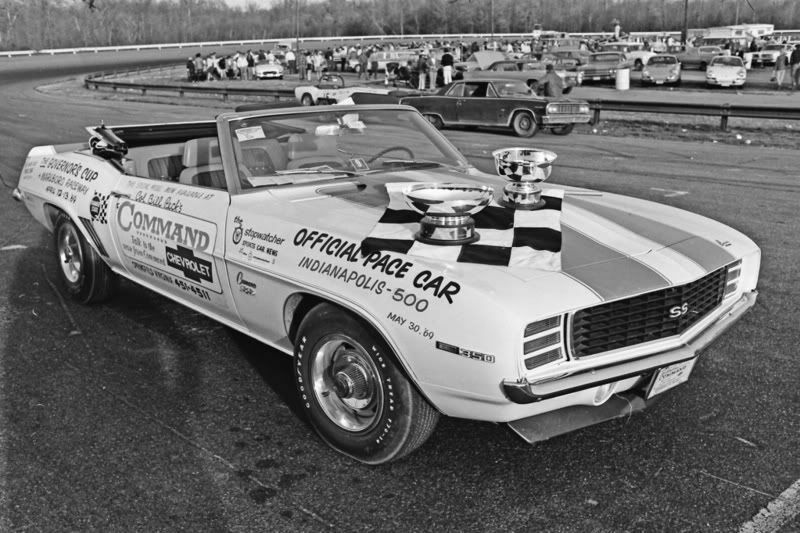 was the pace car for the 1970 Mid-Ohio Trans-Am race. I am still trying to find a pic of the 68 Z convertible pacing the 68 Can Am race. I remember seeing the pic somewhere but can't find it. Glad to hear you are finding some things to help you out. 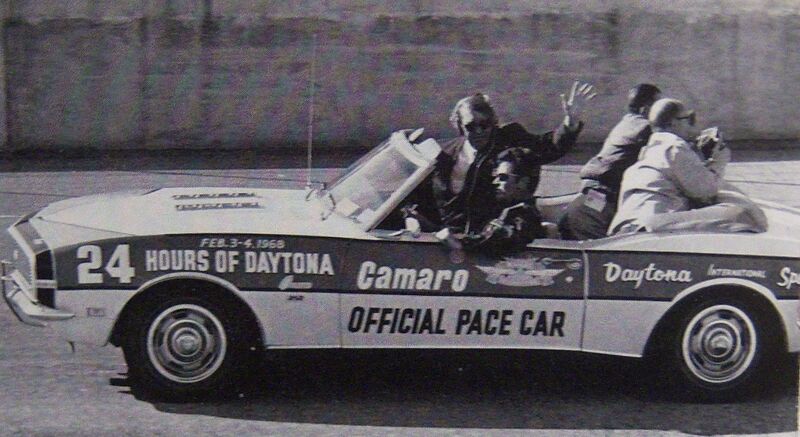 Here is a shot of the '68 Daytona 24hr pace car (SS396) with actor James Garner driving and Nascar boss Bill France in the passenger seat. 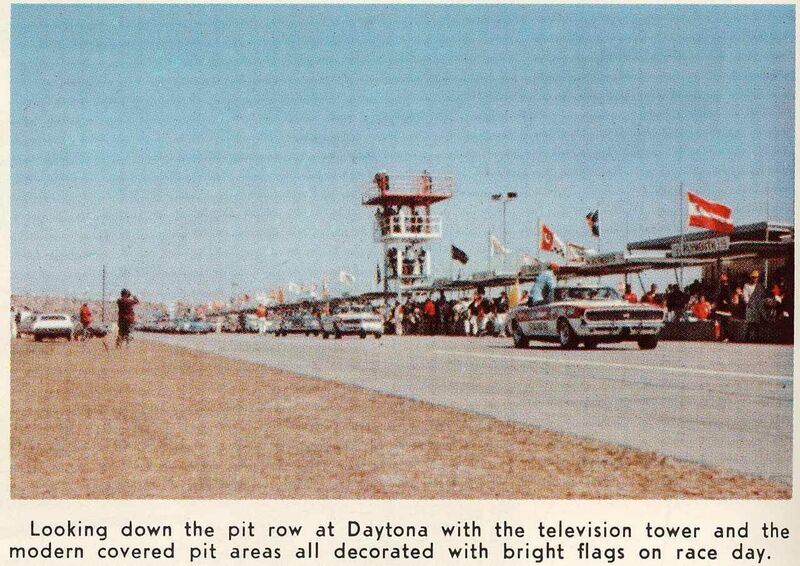 In 1968, the Daytona 24hr race was part of the Trans-Am race schedule. The upper body color is red, if I remember correctly, and the car does have a rear spoiler (although it is cut off in this photo). This car still exists. 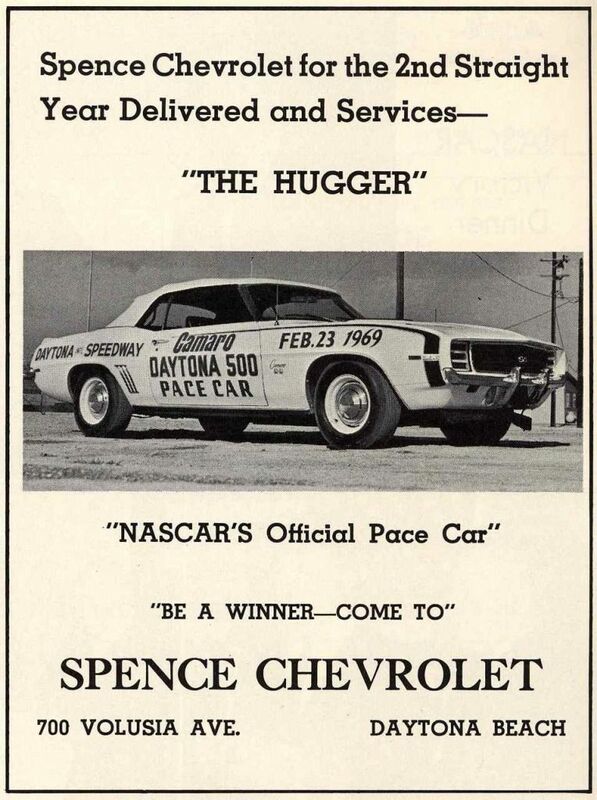 Another couple of pics of the '68 Daytona pace car. It was used all season long for the various races there. 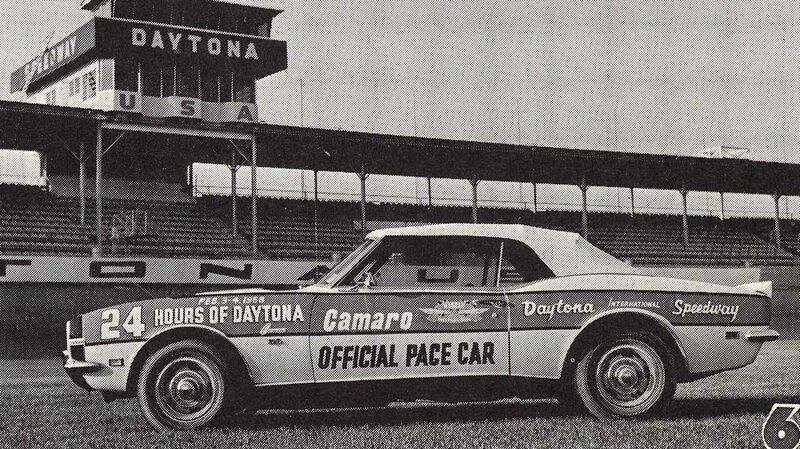 The 1969 Daytona pace car.